My work has provisionally approved my leave for next year between November 2017 and January. This means the planning for my trip to Africa can now advance. Part of this trip is also visiting Dubai (UAE) while flying to Nairobi, Kenya. So the plan is that over 63 days I will visit 10 countries during this trip; UAE, Kenya, Uganda, Tanzania, Malawi, Zambia, Botswana, Zimbabwe, Namibia and South Africa. I’m hoping to book a first class award seat on Emirates A380 flight from Melbourne to Dubai. This first class ticket would include a chauffeur limo pickup to the airport, first class lounge access and shower access on board the plane (read a Review here). This is definitely a bucket list experience; just once I want to see what the 1% live like, even if I need to use award points to experience it! I’ll likely spend a few days in Dubai, maybe experience falcon hunting while there. I’ve been to both Egypt and South Africa before but that leaves a lot of countries and experience in between on this amazing continent. I’ll be travelling with On The Go Tours and undertaking their Great African Expedition 57 Day Nairobi to Cape Town. This is mostly camping in very remote areas, out there with nature. 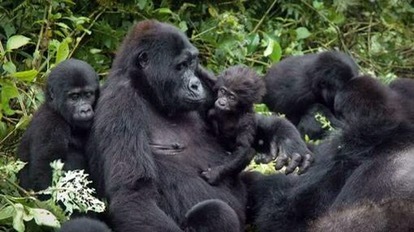 Despite this being a tour there are lots of options to consider but I definitely know I’m going hiking to find Gorillas in Uganda and a helicopter ride over Victoria Falls. I think I’ll undertake almost all game drives and hikes, and any cultural experiences available. Visiting the ‘cradle of life’ during a three day excursion in the Serengeti region is also high on my list. Since this is a camping and hiking trip I’ll need to get my fitness levels up considerably. I’ll be so remote that I can forgot about internet access for long periods of time (oh no!!) and even finding electricity to charge my digital camera will be a challenge especially during the first few weeks. Very exciting. Now it’s time to save money, research countries and options, and get fitter. This entry was posted in Travel, World Trip 2017 and tagged Africa. Bookmark the permalink.